Shawn Brannigan is AS&L's General Manager-- he's our go to guy for, well... everything! Shawn's grandfather, Mickey, made AS&L what it is today and is dearly missed by everyone here. Sherwood was born in Leeds, Maine in 1917. He was the second born of four boys and one sister (the sister being the youngest). Being born into a family with an alcoholic father, during prohibition, Pa had to grow up quickly. I remember him telling me once his father broke an axe handle over his back. Another time he was given a job to do being promised a bottle of pop as a reward. He was quite disappointed; after anticipating a nice bottle of cold orange pop he was handed a warm Moxie. Needless to say Pa did not have a fun-filled childhood. At the age of 12 Pa had to leave home to go to work on a dairy farm. He sent all the money he made home to his mother to support her and his siblings. I remember him telling me that the schoolmarm would get upset with him for not getting his homework done. He tried to explain to her that he had to milk 15 cows both morning and night and did not have time to do homework. But, she had no mercy—telling him that he simply had to milk faster! He later attended and graduated from Monmouth Academy. He was the starting quarterback on their varsity football team. The football coach assistant happened to live next to the dairy farm Pa worked at. He got to know Pa—noticing that Pa would practice his sprints after finishing his milking. His hands were also the size of man’s twice his size. The assistant coach told the head coach to try Pa out at QB, he was sure Pa would be the man for the job. During his senior year, Monmouth Academy won the state championship with Mickey at the helm. Monmouth Academy is also where Mickey met his beloved Isabelle. After graduating high school Isabelle went off to college and Mickey joined the CCC’s. While in the CCC’s he eventually became head cook of his camp, all the while sending most of his pay home to his mother. After the CCC’s Mickey got a job in Kennebunk cooking at a restaurant. It was here that, by chance, Mickey ran into his beloved Isabelle. They were later married and spent 73 years together. She was also the one who introduced Mickey to his Lord and Savior Jesus Christ. Over time, Jesus came to be the center of his life, but we will get to that later. After getting married Mickey and Izzy landed and settled in Falmouth, Maine. Mickey went to work as a farm hand part-time and also worked full-time at Morrell’s Coal and Grain. At Morrell’s he started out as a delivery driver. Pa tells a story about dumping two tons of bulk coal into the wrong cellar. He had to hand shovel it all back out again, “I only made that mistake once!” Mickey would say with a chuckle. Whenever the boss needed someone to work late to hand unload a train car of coal or grain Mickey was always the first to volunteer. He soon was promoted to assistant store manager. 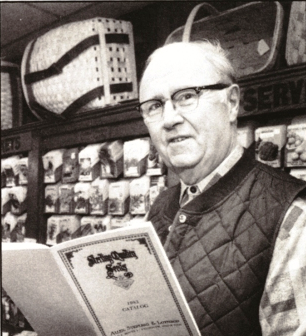 In the fall of 1911 Coleman Allen, Lewis Sterling, & Harry Lothrop opened a farm and garden supply store on Exchange Street in Portland, Maine (Allen, Sterling, & Lothrop, Inc.) In 1914 Mr. Allen and Mr. Sterling left the company. Harry Lothrop ran the company from 1914 to the mid 1950’s. In the mid ‘50’s the company was still staggering from the Great Depression of the ‘30’s. Mr. Lothrop was also getting along in age. At this time Mr. Lothrop was in his mid 70’s and looking for someone to manage his business. He had heard about Mickey Maquire, so Harry called Mickey in for a meeting. Harry’s offer was for Mickey to pay him a certain amount every week until the day he died and the company would be Mickey’s. A hand shake later, the deal was done. Mickey was then the new General Manager of Allen, Sterling & Lothrop. After things got rolling many of the employees were unhappy because now, under Mickey, you actually had to work. After a time he got the company back on its feet and operating in the black again after years of running in the red. In 1969 Mickey was forced out of his Middle Street location by urban renewal (the old location was where One City Center is now). Mickey needed to find a new location for Allen, Sterling & Lothrop. He narrowed it down to two possible locations. Route One in Falmouth or Route 100 also in Falmouth. With some thought, professional studies and lots of prayer, God guided him to Route One in Falmouth. Initially, this location was a higher investment but in the end a much better investment. I remember Pa telling me he questioned his decision at first, but over time he could see it was, without a doubt, the best decision. Mickey ran Allen, Sterling & Lothrop at its Falmouth Location for about 10 years. In 1980 Mickey sold the business to his daughter and son-in-law—Shirley and Tony Brannigan. After retiring Mickey did not spend a lot of time sitting around. He still drove the truck for AS&L during busy season. He put in a bigger vegetable garden than he had ever had in the past. He would spend a month in Florida watching the Red Sox spring training. He and Isabelle would do lots of local day trips or overnights. They were both also very active in their church, West Falmouth Baptist Church. Their faith in Jesus Christ was rock solid. When there was something that needed to be done or money needed to be given Mickey and Izzy could be counted on. They understood the simple fact that if you put Jesus first everything else will fall into place. Mickey also had an unbelievable love for Isabelle. A love like I have never witnessed. You would have had to know Mickey and Izzy to fully understand. In Mickey’s younger days he was loud voiced, aggressive, and had a bone crushing rip (from all the milking I would suspect). Izzy was gentle, soft spoken and didn’t say a lot. But, in Izzy’s hand Mickey was putty. As the years passed Mickey and Izzy stuck closer and closer to home. Mickey eventually had to give up driving the delivery truck and had to head into the seed room to pack seed with Izzy. That is, pack seed and tell stories. Man could Mickey tell a story. He was so good at it you could listen to the same one over and over. He was as happy sitting there packing seed as any man. He loved being around his family and friends. In the end Mickey and Izzy shared the same room in a nursing home. In 2008, with Mickey at her side Izzy was called home to Jesus. In the next year, surrounded by family in the same room, Mickey went to dance with Jesus and, of course, Izzy. I would sit in that room with Pa after Nan left. Sometimes talking, sometimes listening to stories and sometimes just sitting. At this time in his life Mickey couldn’t see, couldn’t stand up straight, and couldn’t walk on his own—but, he always had a smile on his face. When I would arrive to visit I would ask Pa how he was and always with a thumb pointed up he would answer with a loud “Great!” Always at least once during our visit he would point a crooked finger to the sky and say “He’s been awful good to me.” Man how he loved Jesus and, of course, Izzy!